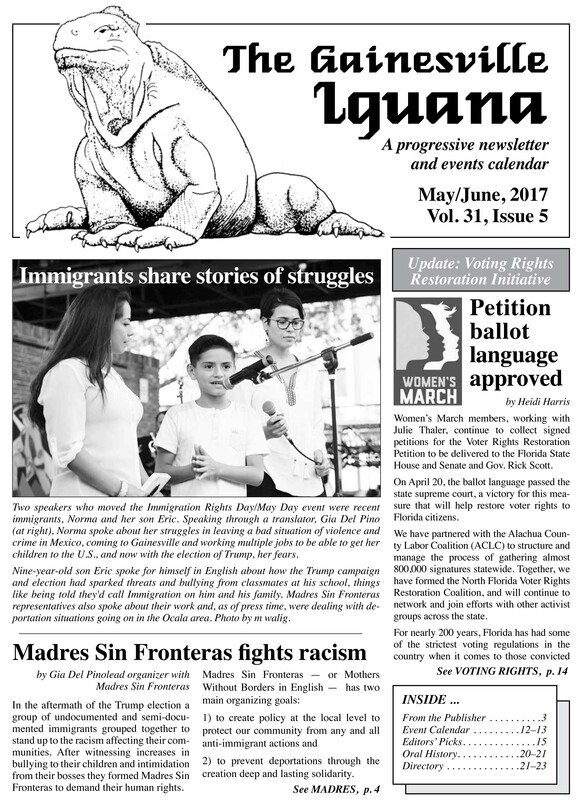 Thank you for donating to the Gainesville Iguana. 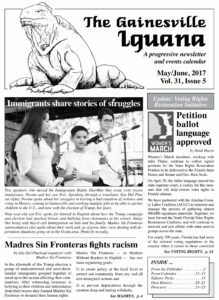 Your support helps sustain the work of an all-volunteer staff and existence of the area’s longest running progressive newsletter. Without you, we couldn’t do what we do and have done each year (okay… we did take one year off) since 1986. 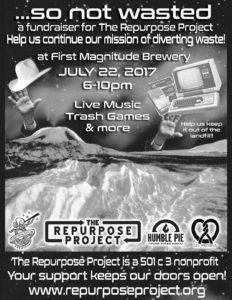 The Repurpose Project is excited to announce its …so not wasted fundraiser at First Magnitude Brewery at 1220 SE Vietch St., Gainesville, on July 22, 2017 from 6-10pm. 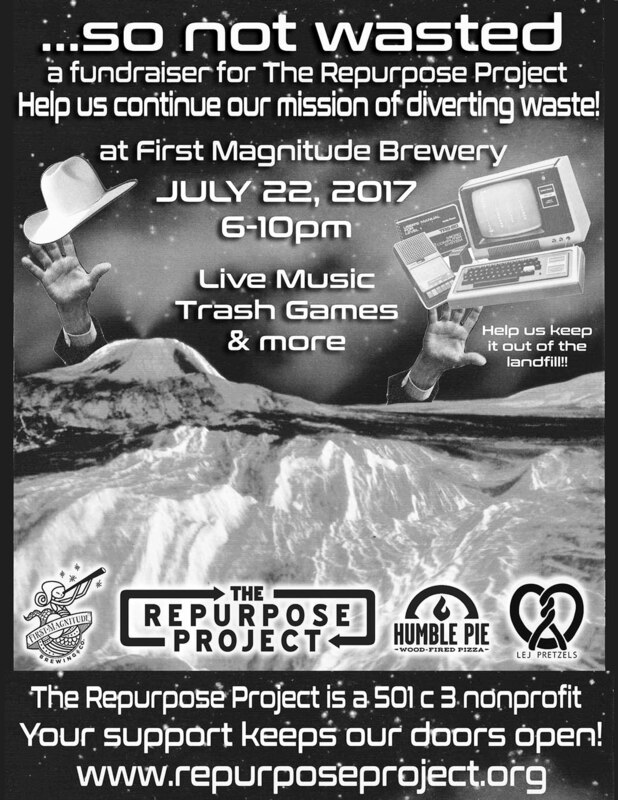 Join us for a fun evening of trash carnival games, waste stream education, a serious and not-so-serious auction starring our very own fast talkin’ auctioneer, live music, the Trash Princess, raffle, silent auction, local beer, pizza and pretzels. Learn about our mission and ways to tread lightly on the planet. Veterans for Peace will be displaying more than 6,915 tombstones from dawn on May 27 through dusk on Memorial Day on 8th Avenue just east of 31st Street as part of their Memorial Day Weekend event. This display is to remember those who have died in the wars in Afghanistan since 2001 and in Iraq since 2003. The tombstones will line the street along 8th Avenue just east of 31st Street, where the Solar System Walk is located. This is the tenth year VFP has set up the display, and in 2008 we had to cross over to the North side of Eighth Avenue due to the continuing number of deaths in Iraq and Afghanistan. Lilly Sanchez [LS], of Nevada’s Western Shoshone tribe, and her daughter Virginia [VS] and granddaughter Cora Burchett [CB], were interviewed by Ryan Morini [RM] in December 2012. This is the 40th in a series of transcript excerpts from the Samuel Proctor Oral History Program collection at the University of Florida. LS: My name is Lilly Virginia Sanchez. I was born in Duckwater, where my grandfather always lived, under the willows. We never go to doctors those days, we just have our grandmother as a midwife. RM: When were you born? RM: Were you delivered by a midwife? LS: Yes, by my grandmother, Mary Blackeye. My parents was Agnes Blackeye Penoli, and my father was Frank Penoli. Veterans for Peace Gainesville Chapter 14 has announced the 8th Annual Public Reading and Reception of the Alachua County Peace Poetry Contest and Peace Scholarship Awards. On Saturday, May 20, 35 students from Alachua County schools will read their peace poems aloud at the Unitarian Universalist Fellowship as winners of the 2017 Peace Poetry Contest. The eighth annual Peace Poetry Contest began in January, inviting all K-12 students of Alachua County schools, both public and private, to submit one poem on what peace means to them. A team of community writers and poets judged the over 280 poems submitted, according to age group. You’ve seen our logo and call letters advertised in these pages for going on ten years now. WGOT-LP FM, in partnership with the Civic Media Center, has been broadcasting continuously since 2008. Recently, you may have read that WGOT-LP FM moved to a new frequency (100.1 FM) and a new studio space within the space of one month; that’s a major leap in such a short period of time (not to mention the installation of a new antenna to help our signal strength). Alachua County Revolution’s purpose is to continue the political revolution Bernie Sanders started, through effective local action and is modeled after Our Revolution, the successor organization to the Bernie Sanders campaign. ACRev supports other local, progressive and activist groups and hopes to identify a new generation of progressive leaders to fight for progressive change and help to elevate the political consciousness. ACRev promotes local action and sharing of events through the www.acrev.org site. In the Editors’ Picks on this page there is a listing for a talk given in Chicago and hosted by Haymarket Books. It features Michelle Alexander and Naomi Klein, two leading thinkers and analysts of our time. It is about 90 minutes and well worth it. In her opening remarks Alexander questions the concept of Resistance as applied to the opposition to the Trump presidency. She says she appreciates how the term came into use, but then she turns it around. Women’s March Gainesville is the official local chapter of Women’s March Florida, the originators of the Women’s March on Washington on Jan. 21. We pride ourselves on being a non-violent organization with a pro-woman, pro-community, pro-sustainability, pro-love, and pro-diversity focus. We believe in art as a means of revolutionary change. Our organization is a great place for first time activists as well as long-term activists interested in getting involved with the local government and our community. Writer and illustrator Thi Bui, who has written the graphic memoir The Best We Could Do, an intimate and poignant graphic novel portraying her family’s journey from Vietnam during the war, will be speaking and reading on May 30 at the Civic Media Center. The event runs from 6:30 to 8 pm. This beautifully illustrated and emotionally evocative memoir is about the search for a better future and a longing for the past. Exploring the anguish of immigration and the lasting effects that displacement has on a child and her family, Bui documents the story of her family’s daring escape after the fall of South Vietnam in the 1970s, and the difficulties they faced building new lives for themselves. Climate change denial has been around for years. But there’s another climate-related denial that is just as damaging: alternate energy denial. You usually hear this put-down of alternate energy from utilities that fear loss of control and income as people discover ways to produce their own power. Solar electricity is often the target for alt-energy denial. We’ve heard for years, “It’s too expensive; it’s inefficient; we need more research.” But the efficiency of PV (photo voltaic) panels has increased as their price has dropped the last few years. More people are buying them, while utility companies fret. Over the past few months in our area, I have seen the following examples of alt-energy denial, actual quotes from local officials. I will comment on each one according to my experience as a user of solar electricity to power my home with a system I installed in 1984. Only 20 years? Your car should have such a warranty! But that’s just a warranty, not the life of the panels. My PV panels have been producing more electricity than I can use for 33 years. The panels General Electric made 60 years ago still work. Some scientists predict PV panels could work for 100 years; there are no moving parts to wear out (although there is slight loss of output). You will never have to buy new panels unless you want to expand the size of your system, and it is easy to wire on new panels. Yes they do, just not as much as in bright sun. My PV panels fully charge my batteries by around noon or 1 p.m. On cloudy days it may take until 2 or 3 p.m. to get a full charge. I know this as fact from 33 years of checking my battery voltage. I simply push a contact button on my wall to see the voltmeter reading. For more than three decades the Zomeworks Company has built an efficient tracker that moves panels to follow the sun across the sky all day and then repositions them for the next morning, all with self-contained solar power. But my panels don’t need to move. PVs actually work better in winter, producing more power when they are cold (a balance to the shorter days of sunlight). That’s why an air space between the panels and roof is important during hot weather (and why solar shingles are less efficient). Ice and snow are no problem in the Sunshine State. If northern PV panels don’t slope enough, snow may accumulate. But a rare covering of ice would still let enough sunshine through to produce electricity. That may have been true 30 years ago, but in some communities, solar electricity is the same cost as coal generation (fossil fuels and nuclear would be far more expensive without their government subsidies and tax breaks). But what is the added cost of burning coal for electricity? Damage to humans who have to breathe its toxins, as well as the heat of burning coal that is warming up our planet (2016 was the hottest year on record). I am one individual using solar electricity to pump all my water from a well. I use solar for lights, fans and assorted 12-volt appliances. The cost of my PV system, figured over the years I’ve used it, is $8 a month. Does that sound expensive? I also use $5 a month worth of grid power (plus the customer fee of $20, and taxes) for my refrigerator, lights and TV. My house is wired for these two separate systems, so I am less affected when the grid goes down during storms. Solar is only more cost effective on a citywide basis for the utility company so they can sell solar electricity to their customers. They don’t make profits when people have their own solar “power companies” on rooftops. Making electricity on site with PVs is more efficient than having to transport it over long distances, losing power along miles of lines. Of course our local utilities would rather have “solar farms” that they can own and control to sell power to their customers as they always have. As for cities being able to use the “latest technology,” PVs themselves have changed very little over the decades. What has changed is that they are much more efficient and cheaper than ever. I paid $260 for a 30-watt panel in 1984. Now you could buy a 300-watt panel for the same amount. Why do our utility officials tell us all these falsehoods about solar electricity? Control and profit. They can sell electricity for a profit when they control the buying and selling of coal, gas, oil and nuclear. But they have not figured out a way to sell us sunshine, except with their own solar farms. In the stock market fossil fuel has been among the worst performing sectors, while investors are now piling more money into renewables, because that’s where the growth will come. Economics will kill alt-energy denial. Perhaps our local utilities will someday work with their customers to promote and sell PV panels. But they are used to doing business their old way, so for now they will use alt-energy denial to dissuade us from installing our own PV power, using free sunshine. In honor of Endangered Species Day, Lubee Bat Conservancy will host our Open House/Open Wings event, Saturday, May 20 from 11am to 3pm. The entrance fee is $5/person, and children 4 and under are free. Guests will have a chance to listen to educational talks, check out native bat houses, talk to experts on installation and exclusion, and of course, view the beautiful bats playing with numerous toys. Great fun for all ages! Director Brian Pope will give a special presentation on endangered species, wildlife trafficking, and the importance of preserving animals and habitats. This family-friendly event focuses on endangered species, native bats, and viewing the largest bats in the world. All proceeds benefit Lubee’s conservation and education efforts. The Facebook Open House/Open Wings event page is at https://www.facebook.com/events/408495889514803/). The event will take place at 1309 NW 192nd Ave. in Gainesville. For more information, call 352-485-1250 or go to www.lubee.org. Forage and Blue Oven Kitchens have been working together and collaborating with our community to support and expand our local food system for over five years. Their latest endeavor is no exception. The ambitious and exciting project – Working Food – will allow the organizations to combine forces and provide a physical hub for efforts at the intersection of Kitchens, Commerce, and Culture. These are challenging times to make sense of. Last week we saw Trump fire the director of the FBI and also announce thousands of more troops to Afghanistan. Healthcare is in the hands of the Senate. Each of these acts will impact lives and set off chains of events whose outcome we cannot know in advance. We are along for the ride, and it can easily make one feel powerless. But powerless we are not. Florida’s House, Senate, and Governor are all Republicans and thank God they don’t get along. This last session had both losses and defensive victories for working families. The overarching theme of the session was that of disunity and political bickering. House Speaker Richard Corcoran (R, Land O’Lakes) held many bills and the budget hostage, while Senate President Joe Negron (R, Palm City) and Governor Rick Scott did their best to save face. Women’s March members, working with Julie Thaler, continue to collect signed petitions for the Voter Rights Restoration Petition to be delivered to the Florida State House and Senate and Gov. Rick Scott. On April 20, the ballot language passed the state supreme court, a victory for this measure that will help restore voter rights to Florida citizens. We have partnered with the Alachua County Labor Coalition (ACLC) to structure and manage the process of gathering almost 800,000 signatures statewide. Together, we have formed the North Florida Voter Rights Restoration Coalition, and will continue to network and join efforts with other activist groups across the state. In the aftermath of the Trump election a group of undocumented and semi-documented immigrants grouped together to stand up to the racism affecting their communities. After witnessing increases in bullying to their children and intimidation from their bosses they formed Madres Sin Fronteras to demand their human rights.